In large saucepan, heat butter and marshmallows over low heat, stirring constantly, until marshmallows are melted. Remove from heat; stir in vanilla and food color. Fold in cereal until evenly coated. On waxed paper, quickly shape warm mixture with buttered hands into Christmas tree shapes, using about 2/3 cup mixture for each place card-size tree or 1/4 cup mixture for each cookie-size tree. 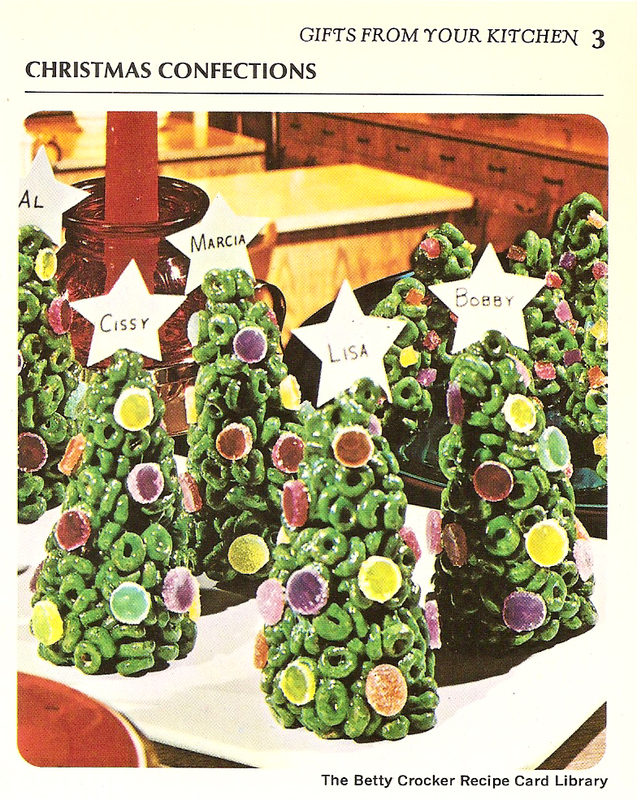 For ornaments, cut gumdrops into slices and press onto trees. 6 to 8 place card-sized tress or 16 to 20 cookie sized trees. Cereal Christmas Balls: Shape mixture into balls, using about 1/2 cup mixture for each. Cut gumdrops into fourths and press onto balls. 8 balls. In top of double boiler over hot water, heat 28 vanilla caramels in 2 tablespoons water, stirring frequently, until caramels are melted and mixture is smooth. Pour caramel mixture over 5 cups Kix cereal; mix gently. Drop mixture by spoonfuls onto waxed paper. Let stand until firm. About 3 dozen candies.